Former Ohio Gov. John Kasich gave out Courage Awards during his last State of the State address, given at Otterbein University in 2018. Kasich will have an office at Otterbein, in his adopted hometown of Westerville. John R. Kasich is leaving the Statehouse after serving two terms as Governor of Ohio for a new office at Otterbein University in Westerville, his adopted hometown. Kasich will serve as a senior fellow at the University while using his campus office to pursue his future endeavors, including as a commentator for CNN. Many of his CNN interviews will be broadcast from the university campus. “Otterbein University is a great school in my hometown and I look forward to spending time on campus,” said Kasich. 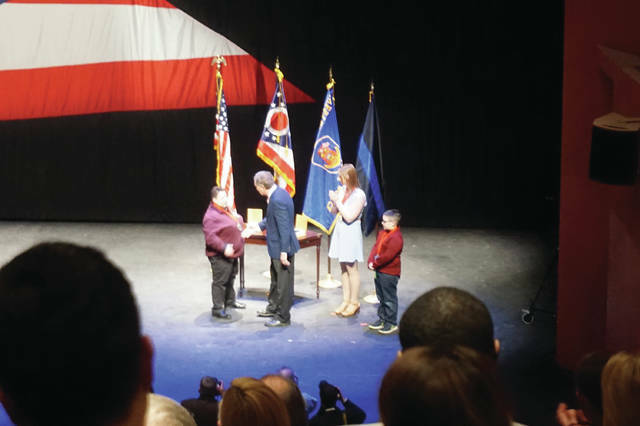 Kasich served as governor of Ohio from 2011-2019 and presented his final State of the State address from Otterbein University last March. A former presidential candidate, he also served in U.S. Congress for 18 years where he was Chairman of the House Budget Committee and chief architect of the first balanced budget in decades. As governor, his top priority was to create a jobs-friendly climate to increase opportunity for all Ohioans. By closing an $8 billion budget shortfall without a tax increase, reducing taxes by $5 billion, cutting wasteful spending and eliminating red tape, Ohio jobs have grown by nearly 570,000 and the Buckeye State is in a stronger position than it was when Kasich took office. In addition to his public service, Kasich is the author of four New York Times best-sellers: Courage is Contagious; Stand for Something: The Battle for America’s Soul; Every Other Monday; and most recently Two Paths: America Divided or United, which reflects on his 2016 presidential campaign and his hopes for America’s future. Otterbein University is a private university nationally recognized for its intentional blending of liberal arts and professional studies through its renowned Integrative Studies curriculum and its commitments to experiential learning and community engagement. Otterbein is recognized by Colleges of Distinction, with additional Field of Study recognition in business, education, engineering and nursing. Otterbein is a recipient of the 2015 Carnegie Community Service Classification; a finalist for the 2014 President’s Award for Economic Opportunity Community Service; and has been honored With Distinction by the President’s Higher Education Community Service Honor Roll since the list’s inception in 2006. It stands in its category’s top 10 percent in U.S. News & World Report’s guide to “America’s Best Colleges.” It also is recognized in national rankings by Forbes and The Wall Street Journal. Otterbein has 2,400 undergraduate and 500 graduate students enrolled in its more than 70 undergraduate majors; six master’s programs; and doctorate in nursing practice (DNP). Its picturesque campus is perfectly situated in Westerville, Ohio, America’s fifth friendliest town (Forbes), just minutes from Columbus, the 14th largest city in the country. To learn more about Otterbein, visit www.otterbein.edu. https://www.sunburynews.com/wp-content/uploads/sites/48/2019/01/web1_John-Kasich-gives-Courage-Awards.jpgFormer Ohio Gov. John Kasich gave out Courage Awards during his last State of the State address, given at Otterbein University in 2018. Kasich will have an office at Otterbein, in his adopted hometown of Westerville.